On Thursday in eastern Ukraine – where Russian-supported separatists have declared an autonomous state – a plane with civilians on board was shot down. The plane did not crash and it did not “collapse” – as was written by some of the Russian media – it was shot down from the ground. We in Russia know this – if not from our own news organizations, then from several video commentaries, including one in which a little boy says, “Look! A junta plane has been shot down! Well done, DPR!” (The DPR is the Russian-backed Donetsk People’s Republic, and the “junta” is the legally elected government of Ukraine – the typical way for Russian propaganda to refer to the present government in Kiev.) This child does not know – and may never find out – that the downed aircraft had children like him on board. In their reporting on the tragedy, the Russian media defined the accident scene as “east of Ukraine”, forgetting the terms such as “New Russia”, “DPR”, “LPR” – the Lugansk People’s Republic, another separatist territory in Ukraine – for the evening. In the new Russia, such errors could not have happened, so they simply won’t have happened. Our government, and its collaborators in the media, will see to that. The people do not need to see tragedies, they seem to believe – only victories of the Russian soldiers, the heroes of their homeland, and the brave patriots in eastern Ukraine that we should support. Alexander Boroday, the prime minister of the self-proclaimed DPR (who was added to the US sanctions list a day before MH-17 was taken down) simply declared: “If it really was a passenger airliner, we did not do it”. This statement is a concise version of the position often adopted by Russian authorities: do not admit to anything, whatever happens, however obviously untrue. Almost immediately after the tragedy, Ukrainian president Petro Poroshenko officially announced that Ukrainian troops were not involved in the attack on the airplane, noting that they didn’t even have weapons capable of shooting down a plane at that range. Russian President Putin responded to Poroshenko five hours later by accusing Ukraine of responsibility for the disaster – though all of Russian television media seem to have beaten him to that, at least after they finished repeating that it was a Ukrainian military transport plane that was shot down. By this weekend, the international media will likely stop using the term “militia members” and nobody outside of Russia will call the Donetsk army representatives anything other than “terrorists”. Here, though, Putin will continue his support for the people that the West will call terrorists. The DPR’s anti-aircraft missiles – which everyone believes were used to shoot down the plane – were probably transferred from eastern Ukraine back to their Russia owners under cover of night, and records of their possession have already been erased from Strelkov’s page and widely denied by the separatists who were nonetheless seen using them. But in Putin’s Russia, you can’t believe your eyes. You have to believe what you are told. 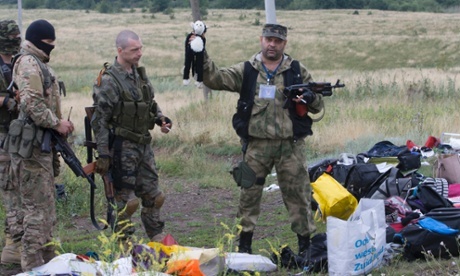 There is too much evidence that the Malaysia Airlines flight was shot down by the pro-Russian DPR army. Not on purpose: it was a stupid, horrible accident, a mistake too easily made when people get confused (or are deliberately confused by their leaders), when inchoate rage and patriotism are aimed at a target as big as the sky. But rather than admit their mistakes, our leaders ask us to accept a lie. After all, as Duma representative Sergei Kalashnikov wrote, “Will it be any easier for you if you find out who shot the plane down?”. It won’t be easy – but it is nonetheless necessary to find out who shot the plane down, though endless layers of propaganda will have to be shoved aside. And having to do so will make the discovery of the truth about this tragedy even more painful, once you understand all the forces that don’t want you to know the truth.